Community Christian Church (CCC) is a multi-campus megachurch. It’s flagship church is Calvary Christian Church located in Naperville, Illinois. The church conducts services at 13 different locations in and around Chicago. The church was founded in 1989 by Dave Ferguson and four of his friends. CCC describes its mission as “Helping People Find Their Way Back to God through the three experiences of Celebrating, Connecting and Contributing”. CCC Pastor Randal Ross says that, around 2010, it became apparent that the sanctuary needed updating. It had been 20 years since the 44-year-old church last remodeled. The sound system was failing, the lighting wasn’t up to par, and the seating capacity needed a boost. In 2014, the Naperville Calvary Christian Church underwent major expansion and renovations in 2014 adding a number of new amenities including Yellow Box, a new state-of-the-art auditorium with theater seating for more than 1,100. Also included in the remodel were a new cafe and lobby spaces to encourage conversation and connection, as well as a 1,000 square foot training center. Although the new auditorium seats nearly double the capacity the previous auditorium could hold, specific design elements were incorporated to create a sense of intimacy in the large, new space. The elements, such as natural light, high-top tables and soft seating along the perimeter of the main floor and varied seating options, were meant to specifically appeal to young adults. The Yellow Box design included four large and irregular-shaped, east-facing windows. Each measure approximately 106″ width x 190″ height and are located right of the stage. Two more windows were located towards the back of the auditorium. The windows allowed unacceptable levels of solar heat and glare into the auditorium. A proper solar glare control system, as well as a motorized control solution was needed to effectively operate the shades in unison. – All motorized shade systems are controlled with ILT motors. – All motorized shades were made with Mermet room darkening fabric (Avila, Black). – All fascia is 4” square, black. Illinois Window Shade Company, in collaboration with Aspen Group, the architect of Yellow Box, designed a room-darkening motorized solar shade system that would solve the solar and control challenges in the Naperville Calvary Church auditorium. 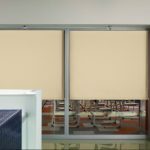 A total of six Illinois Window Shade Company Motorized Roller Shades were designed and installed in each window at the church auditorium. Each shade was fitted with Mermet room darkening fabric (Avila, Black). The fabric was specified due to its durability, 100% solar glare blockage performance, and simple, sleek look which complemented the interior of the sanctuary. In order to effectively operate the shades in unison before, after and during performances, the shades were fitted with ILT (Intelligent Line Technology)motors. The ILT motors allow the shades to be connected to the facility’s network which gives staff the ability to operate the shades with the same computer they use to operate audio/visual equipment. A wall switch was also added for general ease of use. ILT motors allow users the ability to lift and lower the shades in unison or individually. Four-inch square black fascia was used to conceal the fabric roll, providing a clean, sleek look in keeping with the design of the rest of the auditorium. The Community Christian Church-Naperville sanctuary is now supplied with one of the most efficient and capable window treatment that Illinois Window Shade Company has to offer. With a touch of button, church staff now have the ability to lift and lower the shades in unison or individually. Church events are no longer disturbed by intense solar glare and heat. The blackout fabric outfitted on each shade is completely room-darkening and provides total solar protection for the parishioners. Houses of worship and architects across the country are working to design sustainable and affordable solar control solutions. The proper window shade addresses these challenges in a cost effective and practical manner. Well-designed motorized shading solutions not only save energy and money, but also provide another layer of privacy and security when needed.